Charles VIII, Ecole Française, 16th century. Musée Condé, Chantilly. Charles VIII, called the Affable, French: l'Affable (30 June 1470 – 7 April 1498), was a monarch of the House of Valois who ruled as King of France from 1483 to his death in 1498. He succeeded his father Louis XI at the age of 13. His elder sister Anne of France acted as regent jointly with her husband Peter II, Duke of Bourbon until 1491 when the young king turned 21 years of age. During Anne's regency, the great lords rebelled against royal centralisation efforts in a conflict known as the Mad War (1485-1488), which resulted in a victory for the royal government. To secure his rights to the Neapolitan throne that René of Naples had left to his father, Charles made a series of concessions to neighbouring monarchs and conquered the Italian peninsula without much opposition. The coalition formed against the French invasion of 1494-98 finally drove out Charles' army, but Italian Wars would dominate Western European politics for over 50 years. Charles died in 1498 after accidentally striking his head on the lintel of a door. Since he had no male heir, he was succeeded by his cousin Louis XII of France from the Orléans cadet branch of the House of Valois. Charles was born at the Château d'Amboise in France, the only surviving son of King Louis XI by his second wife Charlotte of Savoy. 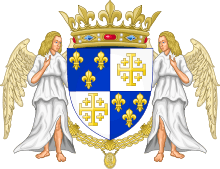 His godparents were Charles II, Duke of Bourbon (the godchild's namesake), Joan of Valois, Duchess of Bourbon and Edward of Westminster, the son of Henry VI of England who had been living in France since the deposition of his father by Edward IV. 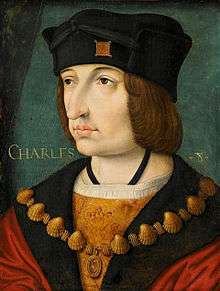 Charles succeeded to the throne on 30 August 1483 at the age of 13. His health was poor. He was regarded by his contemporaries as possessing a pleasant disposition, but also as foolish and unsuited for the business of the state. In accordance with the wishes of Louis XI, the regency of the kingdom was granted to Charles' elder sister Anne, a formidably intelligent and shrewd woman described by her father as "the least foolish woman in France." She would rule as regent, together with her husband Peter of Bourbon, until 1491. In 1488, however, Francis II, Duke of Brittany, died in a riding accident, leaving his 11-year-old daughter Anne as his heiress. Anne, who feared for the independence of her duchy against the ambitions of France, arranged a marriage in 1490 between herself and the widower Maximilian, thus making Anne a stepmother to Margaret of Austria. The Regent Anne of France and her husband Peter refused to countenance such a marriage, however, since it would place Maximilian and his family, the Habsburgs, on two French borders. The French army invaded Brittany, taking advantage of the preoccupation of Frederick III and his son with the disputed succession to Mathias Corvinus, King of Hungary. Anne of Brittany was forced to renounce Maximilian (whom she had only married by proxy) and agree to be married to Charles VIII instead. There still remained the matter of Charles' first betrothed, the young Margaret of Austria. Although the cancellation of her betrothal meant that she by rights should have been returned to her family, Charles did not initially do so, intending to marry her usefully elsewhere in France. It was a difficult situation for Margaret, who informed her father in her letters that she was so determined to escape that she would even flee Paris in her nightgown if it gave her freedom. Eventually, in 1493, she was returned to her family, together with her dowry - though the Duchy of Burgundy was kept in the Treaty of Senlis. Around the king there was a circle of court poets, the most memorable being the Italian humanist Publio Fausto Andrelini from Forlì, who spread the New Learning in France. During a pilgrimage to pay respects to his father's remains, Charles observed Mont Aiguille and ordered Antoine de Ville to ascend to the summit in an early technical alpine climb, latter alluded to by Rabelais. For more details on this topic, see Italian War of 1494–1498. To secure France against invasions, Charles made treaties with Maximilian I of Austria (the Treaty of Barcelona with Maximilian of Austria on January 19, 1493) and England, (the Treaty of Étaples with England on November 3, 1492) buying their neutrality with large concessions. He devoted France's resources to building up a large army, including one of Europe's first siege trains with artillery. In 1489, Pope Innocent VIII (1484-1492), then being at odds with Ferdinand I of Naples, offered Naples to Charles, who had a vague claim to the Kingdom of Naples through his paternal grandmother, Marie of Anjou. Innocent's policy of meddling in the affairs of other Italian states was continued by Innocent's successor, Pope Alexander VI (1492-1503) when the Pope supported a plan for a carving out a new state in central Italy. The new state would have impacted Milan more than any of the other states involved. Consequently, in 1493, Ludovico Sforza, the Duke of Milan, appealed for help to Charles VIII. The next year in 1494, Milan faced an additional threat. On January 25, 1494, Ferdinand I, King of Naples, died unexpectedly. His death made Alfonso II, king of Naples. Alfonso II laid claim to the Milanese duchy. Alfonso II now urged Charles VIII to take Milan militarily. Charles VIII was also urged on in this adventure by his favorite courtier, Étienne de Vesc. Thus, Charles came to imagine himself capable of actually taking Naples and invaded Italy. In an event that was to prove a real watershed and a significant turning point in Italian political history, Charles invaded Italy with 25,000 men (including 8,000 Swiss mercenaries) in September 1494 and marched across the peninsula virtually unopposed. King Charles arrived in Pavia on October 21, 1494 and entered Pisa on November 8, 1494. The French Army subdued Florence in passing on their way south. Reaching Naples on 22 February 1495, the French Army took Naples without a pitched battle or siege. Alfonso was expelled and Charles was crowned King of Naples. There were those in the Republic of Florence who appreciated the presence of the French king and his Army. The famous friar Savonarola believed that King Charles VIII was God's tool to purify the corruption of Florence. He believed that once Charles had ousted the evil sinners of Florence the city would become a center of morality. Thus, Florence was the appropriate place to restructure the Church. This situation would eventually spill over into another conflict between Pope Alexander VI, who despised the idea of having the king in northern Italy where the Pope feared the King of France would interfere with the Papal States, and Savonarola, who called for the king's intervention. This conflict would eventually lead Savonarola to be suspected of heresy and executed by the State. The speed and power of the French advance frightened the other Italian rulers, including the Pope and even Ludovico of Milan. They formed an anti-French coalition, the League of Venice on March 31, 1495. The formation of the League of Venice, which included the northern Italian states of Duchy of Milan, the Republic of Venice, the Duchy of Mantua, and the Republic of Florence in addition to the Kingdom of Spain, the Holy Roman Empire and the Kingdom of Naples, appeared to have trapped Charles in southern Italy and blocked his return to France. Charles would have to cross the territory of at some of the League members to return home to France. At the Fornovo in July 1495, the League defeated Charles. However, it was a pyrrhic victory because the French too celebrated Fornovo as a victory for them. The League lost 2,000 men to his 1,000 and, although Charles lost nearly all the booty of the campaign and had to withdraw to France, the League was unable to stop him from crossing their territory on his way back to France. Meanwhile, Charles' remaining garrisons in Naples were quickly subdued by Aragonese forces sent by Ferdinand II of Aragon, ally of Alfonso on July 6–7, 1495. Thus in the end, Charles VIII lost all the gains that he had made in Italy in 1494. Charles died in 1498, two and a half years after his retreat from Italy, as the result of an accident. While on his way to watch a game of jeu de paume (real tennis) in Amboise he struck his head on the lintel of a door. At around 2 PM, while returning from the game, he fell into a sudden coma, and died nine hours later, perhaps of a subdural hematoma. The Coat of arms of Charles VIII. 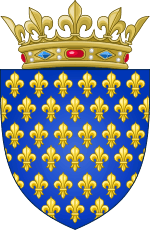 The arms include the traditional element known as France Moderne, three fleur-de-lys on a blue background, quartered with Jerusalem cross, the traditional arms of the Kingdom of Jerusalem. 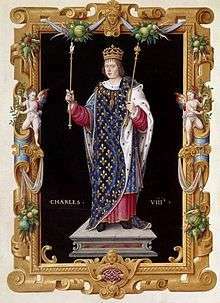 Charles VIII was matrilineally descended from the House of Lusignan, the Kings of Jerusalem. Independent of this descent, Charles VIII also made claims to the Kingdom of Naples, a title which also included a separate titular claim to the Kingdom of Jerusalem. 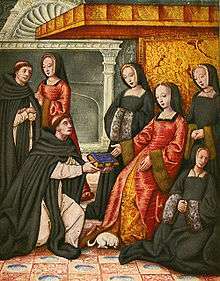 Left childless at his death, Charles' widow, Anne returned to Brittany and there, as hereditary Duchess of Brittany, began steps to regain the independence of the duchy. It was exactly to stymie these moves toward independence that Charles VIII's successor—Louis XII—had his 24-year marriage to Joan of France annulled so that he could marry Anne of Brittany on June 7, 1500. 1 2 Paul Murray Kendall, Louis XI: The Universal Spider (New York: W. W. Norton & Company, 1971), p. 373-374. 1 2 Stella Fletcher, The Longman Companion to Renaissance Europe, 1390-1530, (Routledge, 1999), 76. ↑ Desormeaux, Joseph-Louis Ripault (1776). Histoire de la maison de Bourbon, Tome II. Paris: Imprimerie royale. p. 249. Retrieved 24 November 2013. ↑ Joni M. Hand, Women, Manuscripts and Identity in Northern Europe, 1350-1550, (Ashgate Publishing, 2013), 24. ↑ Tóth, Gábor Mihály (2008). "Trivulziana Cod. N. 1458: A New Testimony of the "Landus Report"" (PDF). Verbum Analecta Neolatina. X (1): 139–158. doi:10.1556/Verb.10.2008.1.9. Retrieved 7 December 2013. ↑ Hare, Christopher (1907). The high and puissant princess Marguerite of Austria, princess dowager of Spain, duchess dowager of Savoy, regent of the Netherlands. Harper & Brothers. pp. 43–44. ↑ "Histoire et Événements" (in French). p. Le Mont Aiguille - Supereminet invius. Retrieved 31 December 2012. ↑ "L'ascension historique de 1492" [The historic ascent of 1492] (in French). Mont-Aiguille.com. 2009-01-12. Archived from the original on 2009-06-16. Retrieved 3 January 2013. ↑ Michael Mallet and Christine Shaw, The Italian Wars: 1494-1559 (Harlow, England: Pearson Education, Limited, 2012) p. 32. ↑ Michael Mallett and Christine Shaw, The Italian Wars: 1494-1559, (Harlow, England: Pearson Education, Limited, 2012) p.13. ↑ Robert S. Hoyt and Stanley Chodorow, Europe in the Middle Ages (New York: Harcourt, Brace, Jovanovich, Inc., 1976) pp. 618-619. ↑ Robert S. Hoyt and Stanley Chodorow, Europe in the Middle Ages, p. 619. ↑ Michael Mallett and Christine Shaw, The Italian wars: 1494-1559, p. 14. ↑ Robert S. Hoyt and Stanely Chodorow, Europe in the Middle Ages, p. 619. ↑ Robert S. Hoyt, Europe in the Middle Ages, p. 619. ↑ Michael Mallett and Christine Shaw, The Italian Wars: 1494-1559, pp. 20-21. ↑ R. Ritchie, Historical Atlas of the Renaissance, 64. ↑ Michael Mallett and Christine Shaw, The Italian Wars: 1494-1559, p. 11. ↑ Michael Mallett and Christine Shaw, The Italian Wars: 1494-1559 p. 31. ↑ Michael Mallett and Christine Shaw, The Italian Wars: 1494-1559, pp. 32-33. ↑ Frederic J. Baumgartner, Louis XII (New York: St. Martin Press, 1996) p. 79.